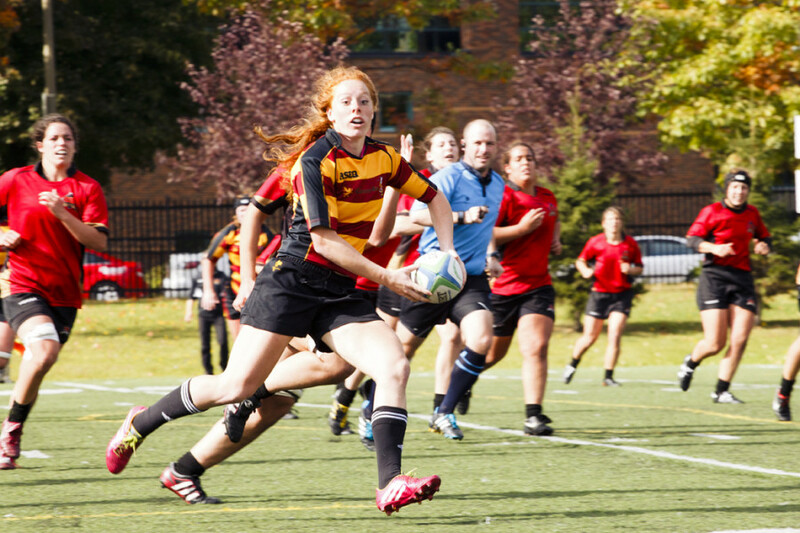 Two games in, the Concordia Stingers women’s rugby team have obliterated their opposition. This past Sunday, the Bishop’s Gaiters were their latest victim after defeating them by a score of 80-7 at Concordia Stadium. In their last two games, the Stingers have scored137 points. In that same span, they have only allowed 10. The Stingers started the game on a slow note. Though they scored first, they allowed the Gaiters to also get on the board shortly after. Despite the slow start, the Stingers were leading 26-7 at the half. Ominous clouds loomed over the Concordia Stadium, however the Gaiters were the only ones getting rained on. Halftime provided the necessary break for the women to regroup and think about what more must be done to really clench the victory. Player of the game, Frédérique Rajotte says that the team realized they were not playing their game and lacked in intensity. The second half was a different story for Rajotte and the Stingers, however, as the star player immediately went for the try zone at the opening of the second half. The Stingers scored 54 points following the break, en route to an 80-7 victory. Coach Graeme McGravie was “pretty happy” with the result. He believes that “the team had a good focus” and executed well everything they talked about and practiced as they prepared for this game. “As a team [we] can continue to improve on various areas such as getting lower on the scrums and getting up quickly after the tackles,” Rajotte said. The next Stingers women’s rugby game is on September 16th at 7pm at McGill.